We're excited to announce that we'll be having another Birdorable Bonanza this summer! We had a bonanza last year, where we added a new bird every day for 17 days in a row (see Birdorable Bonanza 2009). It was so much fun we decided to do it again this year! Starting on July 7th, we'll be adding 18 new birds to Birdorable in our second annual Bonanza! Keep an eye on the blog or follow us on Twitter or Facebook to see all the new birds as they're added to the site each day. Here is a teaser. Can you guess what they'll be? Today's highlighted t-shirt design is our Birdorable Black-necked Stilt, shown here on an infant creeper. These shorebirds live in western and southern parts of the United States and parts of Central America and South America. Aren't they adorable? The American Crow is a common species across much of the United States, where they are year-round residents. Their summer range extends into Canada. American Crows are known to be highly intelligent. Scientists believe part of this is their ability to communicate with one another. They have also proven to be adept at solving food-gathering puzzles. In 2007, hacker Josh Klein developed a vending machine to train crows to pick up coins in return for peanuts. With the innovative teaching machine, crows might someday be taught to perform other tasks, including picking up trash! The American Crow has been on Birdorable since September 2006. Be sure to check out our great collection of American Crow t-shirts & gifts! If you think our Birdorable birds are cute as adults, what about when they are babies? Below are some baby photos (shared via Flickr Creative Commons) of the Golden Eagle. Golden Eagles build huge nests, large bowls of sticks, in high places like cliffs, tall trees or telephone poles. One to four eggs are laid, and incubation lasts 40-45 days. Pretty cute, right? Be sure to check out our (adult) Birdorable Golden Eagle t-shirts & gear! The Sooty Tern is a seabird that breeds on equatorial islands. Outside of breeding, they rarely are seen on land. The Sooty Tern has two nicknames related to its loud and somewhat obnoxious call. It is called the Wideawake Tern; in Hawaiian its name means cacophony. The Sooty Tern used to be part of an important ritual for the people of Easter Island. The clan of the "birdman" who could collect the first egg from a Sooty or Grey-backed Tern each year would control the island's resources. The Sooty Tern has been on Birdorable since July 2007. Be sure to check out our great collection of Sooty Tern t-shirts & gifts! 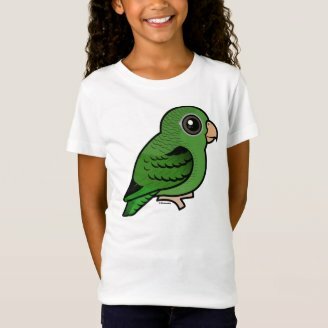 Today's highlighted t-shirts feature the Barred Parakeet, also known as the Lineolated Parakeet. 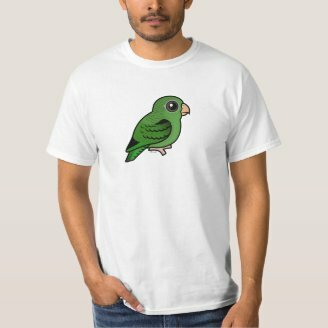 These birds are popular in aviculture and have been bred into different color morphs, four of which are available at Birdorable.